Server is currently closed and will not be opened till further notice. [s]Address is [ IP 216.230.231.220 ] Come and join! We are now using a white-list! Visit this thread to get white-listed. The pony mod is no longer maintained and doesn't work with anything about 1.6.x. Also, do you like Skins? Specifically pony skins for that pony mod up there? Go here to the Pony Skins for Pony Mods topic. No griefing: This means refrain from damaging other people's creations in any way, or stealing from them. Clean up after yourself: If you set off a creeper, patch up the damage. Have some common courtesy: Just because you're playing a video game doesn't mean manners are out the window. Last edited by Shinula on Tue Oct 29, 2013 5:27 pm, edited 40 times in total. Alright then. Well if it's that simple, a server should not be hard to get running. If we need an OP, it should be as simple as putting three or four players as them to work as needed. Also, if the server address could be put up whenever this starts, I'm sure we could experiment rather than just talk about it. May or may not work, but I figure that all the talking won't make it happen. I'm all for a mix between survival and creative. Something I do for four servers was have people prove they deserved the power to switch from survival to creative, and vice versa by building impressive things. Those who could spawn resources would give the builders the stuff they needed. We did this to prevent people who started out from generating TnT, and greifing everything. Mobs being on is also fun, but what about creepers? There's a plug in that we use for a server that prevents a creeper's explosion. This way, all of the buildings/creations made by the builders were safe from creeper explosions. I believe theres another plug in that stops all explosions in general (Beds in the nether, creepers, tnt). This stuff was all done on one server, but the other servers were designated to be either survival, creative, and rp. I really doubt we're going to have a problem with griefing on a Filly server, especially since I'm assuming we'll be using some sort of password just to be safe. Creepers and other mobs do complicate the creative thing, though. There are a few servers I've played on that used various mods and things to fix that, but again, those were all mods. I guess they could always just build a huge wall around Creative and flood it with lanterns. @TheDashingBrony: Nicely done! I reckon it could use a tiny bit of tone, but otherwise it's good. @Apple Jack & no space: Pretty much. Except rather than a password, probably something like using the white-list thing. Honestly that's one aspect I've never used in servers so I don't know how well it works. Besides, well know each other more or less, I really don't see why anypony here would grief. If somepony wants creative mode, might as well put them in it. As for mods again, we can't right now. Bukkit would be nice, but it's not up to date, and won't work with the current Minecraft. While I haven't tested Bravo which Tek mentioned, from what I've read it's not complete with all it's features. I'm all for Survival with a Random Seed! Since this is about Ponies..we just merely need to make sure we all work together for it. Mine Little Pony: Teamwork is Survival. We'll have to figure out the logistics of all that once we find out who all wants to band together, because I definitely wanna do a cooperative thing with anypony else interested in playing that way. I'm not exactly known for my proficiency at building, but I call lumberjack. I'm all for working and building together. It's the best part! Otherwise we might as well all just play single player. Not sure what task I'd be suited for though... unless there is a 'gets eaten by spiders' role. I suppose potion making perhaps, but it will be a while till the parts are gotten for that. Okay, so Shinula will be our proverbial canary in the coal mine. We send her down the shafts first, and if she doesn't come back up, we'll know there's lots of bad stuff down there. I am a terrible builder. But I do make gigantic mines underground. Usually by just digging outward. So if you find gigantic rooms underground, chances are I was cleaning out the ground looking for supplies. Thus Armads and I are are the main diggers/excavators. Now I can never play mine Craft. My addictive personality and MC would be bad enough, but add in MLP? Life over. I don't think we really need designated jobs. Rather, I know I will be making some kind of room where items can be deposited and taken at will. After all, there will be plenty of things you might need, and a communal storage area should work well. Just need to make sure we keep the place safe..heh! 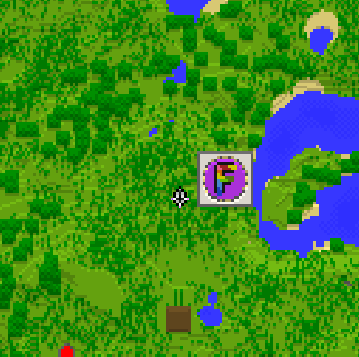 Maybe a designated creeper catcher area..? Ahh well, this will be fun! Can I be on the design team? I like building rooms and access passages and stuff. Of course, I usually design inside mountains and underground stuff, but I can do other stuff too. It seems we have a good team put together already! Though yes, teamwork is going to save us in this mod. We also need a pony to help gather food.. I agree with Armads. Let's not start sorting out in-game jobs until we're, you know... IN-GAME. Assuming we even designate jobs. I'm all for letting ponies just choose what they want to do and then work together. So... how soon before we can get this up and running? Don't mean to sound like we're jumping the gun... but we are. I mean, no use in working this all out until we have a server up and running somewhere. Minecraft server should be up. 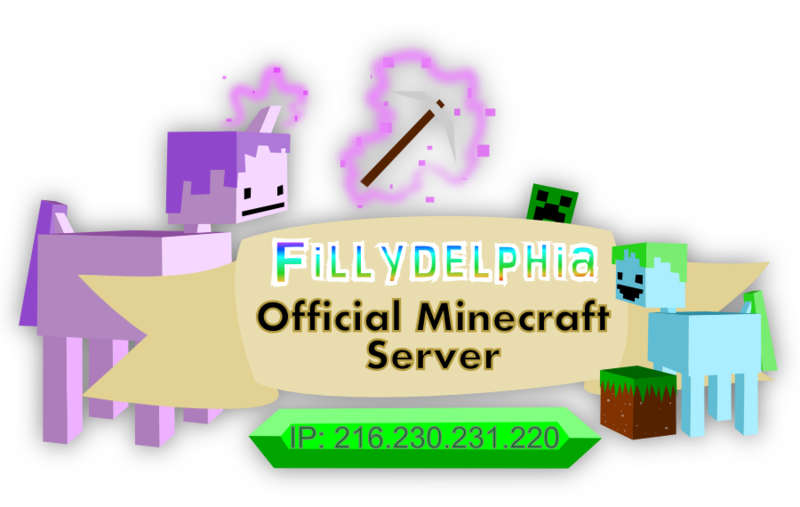 fillydelphia.com [ IP 76.73.5.117 ] please test it out! I don't play Minecraft, but you guys and girls have your work cut out for you. A friend of mine mentioned a tip for mobs, dig a trench around whatever area you want to seal off. A VERY deep trench. Like, down to the lava or whatever the lowest you can go is. Only has to be wide enough they can't jump it or something. I hear they take falling damage. If not, they're still at the bottom of an insanely deep pit. I'm not really sure where this came from, but that's fine. It, however, might be a bit early to discuss that. I think I'll clarify a few things, mostly so everypony understands how mods and everything works. Some of these things probably don't need to be said but I'll say them anyway, just in case. At the moment, Mayday and Ryalor, will be setting up a Vanilla(Meaning no mods) server, with a randomly generated map, in survival mode(Meaning you will start in survival mode, but you can still be changed to creative mode). ANYWAY, at the moment, we can't use server mods. Why? Because there are no suitable ones up to date, or so I understand. 1) Bukkit: This is not really a modded server as such, it's a custom server software program, that replaces the normal Minecraft server. It's a good choice, because you can pick and choose individual plugins for it, which are basically mods, and have the server running exactly how you want it, rather than just having a single server mod which changes various things. But that's not important, I just thought you might like to know. What is important, is this: It's not up to date. It will not work with our current Minecraft clients. 2) Bravo: I looked into this, and not only is not up to date, it's also no longer in development. 3) I got nothing else. If anypony knows any good custom server software or mods, tell me and I'll go test them. HOWEVER, once Bukkit is up to date, or some other good amazing custom server software is found, then I'm told we can experiment with mods/plugins, and see where that goes. So while you can discuss what mods you want, unless they're up to date, they're not much good. Also, Server mods and client mods, are two completely different things. The Pony Mod, will work fine regardless of how the server works. Doh. Well, we could all install older versions of minecraft and use the bukkit for the older one. It's a pain but not impossible. Otherwise, perhaps a coder like myself could apply some mods to the vanilla server manually. There are lots of tutorials I'm sure.